Tight end will be high on the Eagles' wish list in the 2018 NFL Draft. A month ago, we listed the Philadelphia Eagles' five biggest offseason needs. They were, in no particular order, tight end, wide receiver, offensive tackle, linebacker, and defensive tackle. Now that the meaty part of NFL free agency has come and gone (there are still bargain bin guys to be found), let's update the Eagles' biggest needs. 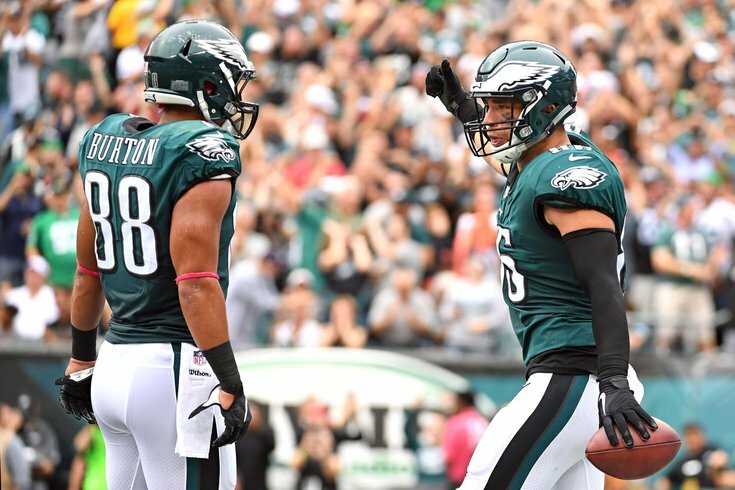 We listed tight end a month ago on the premise that the Eagles were likely to be without both Trey Burton and Brent Celek in 2018. Now that Burton and Celek are indeed both off the roster, the Eagles are going to have a find a tight end or two to back up Zach Ertz. Expect the Eagles to find a cheap veteran tight end with experience on the open market, and look for them to also select one in a deep tight end class in the 2018 NFL Draft. After trading away Torrey Smith to the Panthers, the Eagles are set at two receiver spots with Alshon Jeffery, and slot receiver Nelson Agholor. Beyond them, Mack Hollins showed some promise as a rookie, but it's too soon to rely on a player who has never caught more than 35 passes in a season in college or the pros as your No. 2 receiver. The Eagles' top three weapons in the passing game are going to be Ertz, Jeffery, and Agholor. That is a very good 1-2-3 combination in the passing game, so it's not as if the Eagles need to use a major resource here. Ideally they could find a vertical threat, but even that isn't a must, as all three of their top targets make plays down the field. With LeGarrette Blount leaving to play for the Detroit Lions, the Eagles are left with just two running backs who are certain to be on the roster in 2018. They would be Jay Ajayi and Corey Clement. Ajayi is now in the final year of his deal in 2018, and the Eagles have openly acknowledged his knee issues. Will the Eagles let him walk in free agency next offseason? It's very possible he won't be on the team in 2019. That leaves Clement as the only sure-fire long-term back on the roster. The 2018 NFL Draft is loaded with compelling running backs, just as it was in 2017. The Eagles (probably) whiffed on their running back selection a year ago, but they'll get another crack at it in April. Jason Peters is going to be back in 2018, clearly, and if he's anything close to what he was before he got hurt in 2017, the Eagles will have the best pair of starting offensive tackles in the NFL. They'll also have one of the best reserve swing tackles in the NFL in Halapoulivaati Vaiati, a player who has continuously improved since his rookie season. And this is a need? Not in 2018 it isn't. But the Eagles would be wise to develop another young tackle behind the scenes in anticipation of Peters' retirement, whenever that may be. Also, just generally speaking, it's never a bad idea to keep players in the pipeline at one of the hardest positions to find in the NFL. The Eagles presently have no depth at safety behind the quality starting duo of Malcolm Jenkins and Rodney McLeod. They could certainly still re-sign Corey Graham, who was a quality addition last offseason, but even if they do, they need a young safety to develop behind Jenkins and McLeod. Next offseason, the Eagles would save a little over $5 million if they choose to move on from McLeod, so they would be wise to have a player ready to take over for him if they decided to go that route. Meanwhile, with the loss of Patrick Robinson in free agency, the Eagles have a lot of good, young corners, all of whom play on the outside. What they lack is a prototypical slot corner. If they could somehow find a player who can play both safety and slot corner, that would be ideal, but that's hard to find. In the absence of such a multi-capable player, they should prioritize safety. • Defensive tackle: The Eagles lost Beau Allen, but they quickly filled his spot with Haloti Ngata. That will buy the Eagles a year to see if Elijah Qualls can be a quality third defensive tackle or not. • Linebacker: Presently, the Eagles have their three starting linebackers set, with Jordan Hicks, Nigel Bradham, and Corey Nelson. They also have Mychal Kendricks, who will be too difficult to afford at $7.6 million on the salary cap as a fourth linebacker. I expect him to be on the trading block the bagillionth season in a row. While Hicks and Nelson are in contract years, the Eagles do have a number of young linebackers who could continue to develop. They could certainly look to add to the pipeline of talent there, but retaining Bradham and signing Nelson made that less imperative.